** Quick update at 0900GMT Oct 7, Sunday. China announces to lower RRR for some banks by 1% to release CNY 750B of funds (more details here). The move could trigger a rebound in Asian stocks on Monday, as well as AUD/USD. For now, it’s hard to predict how strong the market reaction is. So, we’ll CANCEL the AUD/USD short strategy, and wait-and-see first. Our GBP/USD short (sold at 1.3150) was closed at 1.3079 with 71 pips profits as updated here. To recap, we made a big mistake in the view on EUR/GBP. 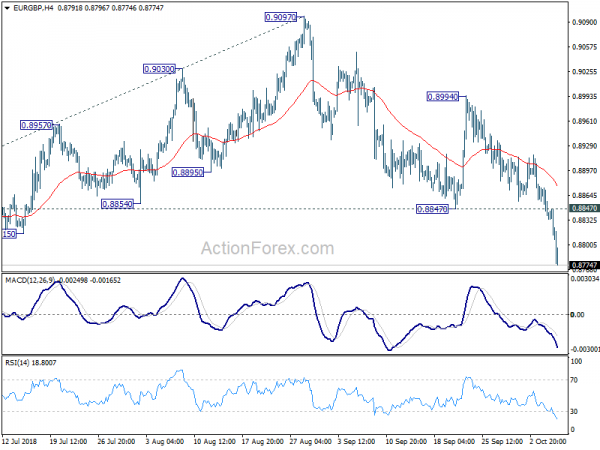 The decline from 0.9097 was believed to have completed at 0.8847. The pull back from 0.8894 was corrective looking all the way, until downside acceleration after breaking 0.8847, which invalidated our view. 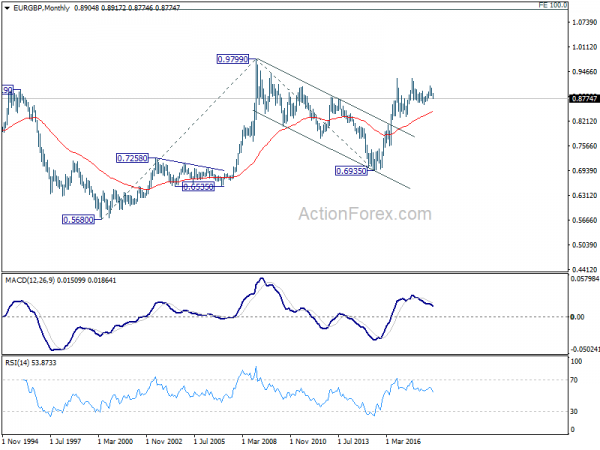 Therefore, the anticipated rally in EUR/GBP which should drag down GBP/USD further didn’t happen. Looking ahead, firstly, we’d expect global treasury yields rally to continue, as led by US. Thus, there is risk of deeper short term pull back in US equities. That should be a factor weighing down Asian markets. Additionally, let’s not forget that the Hong Kong stocks reacted negatively after the announcement of the USMCA trade deal. That’s something seen as rather negative for China, which was on holiday. Adding to that, rhetorics and news against China’s improper practices heated up last week, highlighted by US Vice President Mike Pence’s speech. Chinese stocks should come back from holiday sharply lower. And, focus will be back on key support at 2638 for Shanghai SSE. A break there could trigger some contagion effect to other parts of Asia. 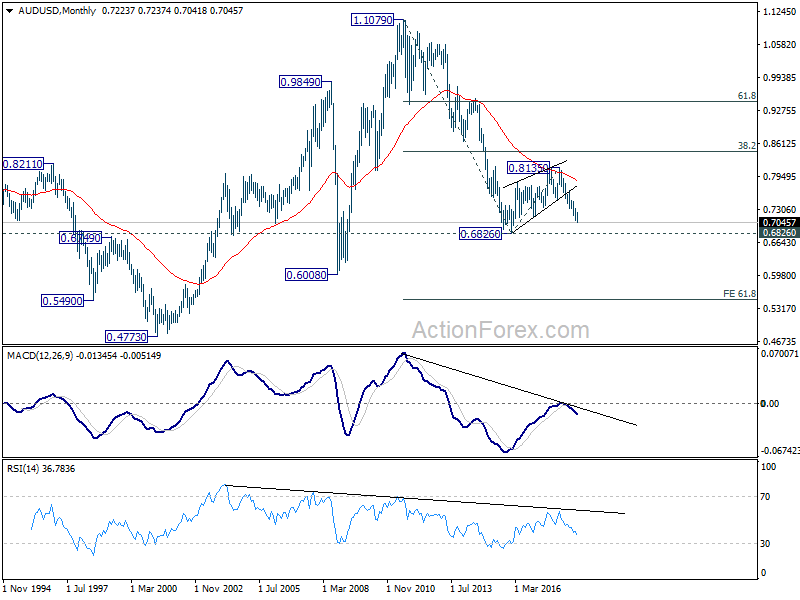 AUD/USD’s break of 0.7084 support confirmed medium term down trend resumption last week. And based on the above anticipated developments, there would only be more downside for Aussie. 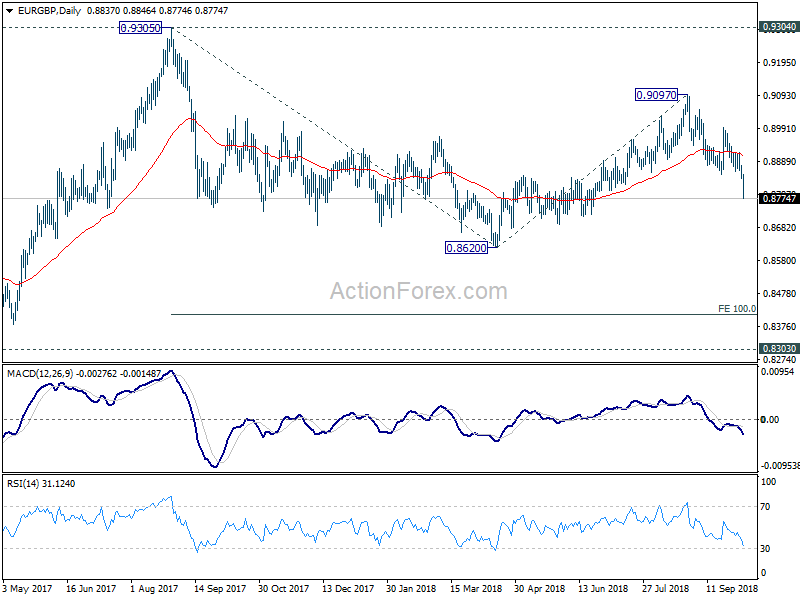 Indeed, from a pure technical point of view, medium term fall from 0.8135 might even be resuming the long term down trend from 1.1079 (2011 high). 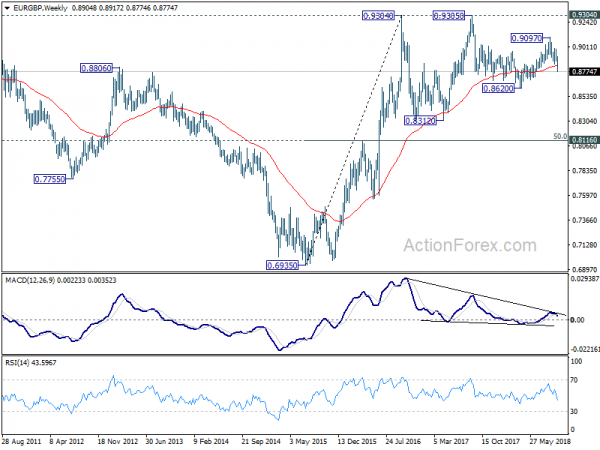 We’ll sell AUD/USD at 0.7100, slightly above 0.7096 minor resistance. 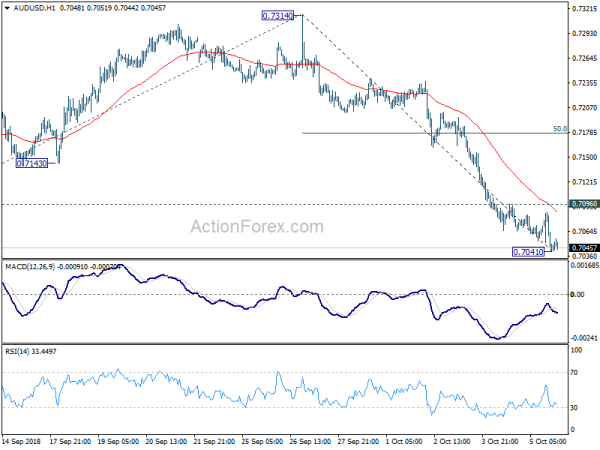 Stop will be placed at 0.7185, slightly above 50% retracement of 0.7314 to 0.7041 at 0.7178. 0.6826 is the first target, which gives risk/reward at 1/3.22. We’ll monitor both AUD/USD and EUR/AUD, as both 0.6826 and 1.6587 are key levels, to decide if we’ll get out earlier, or hold through the target. EUR/GBP dropped sharply to as low as 0.8774 last week as fall from 0.9097 resumed. Initial bias stays on the downside this week for 0.8620 low next. 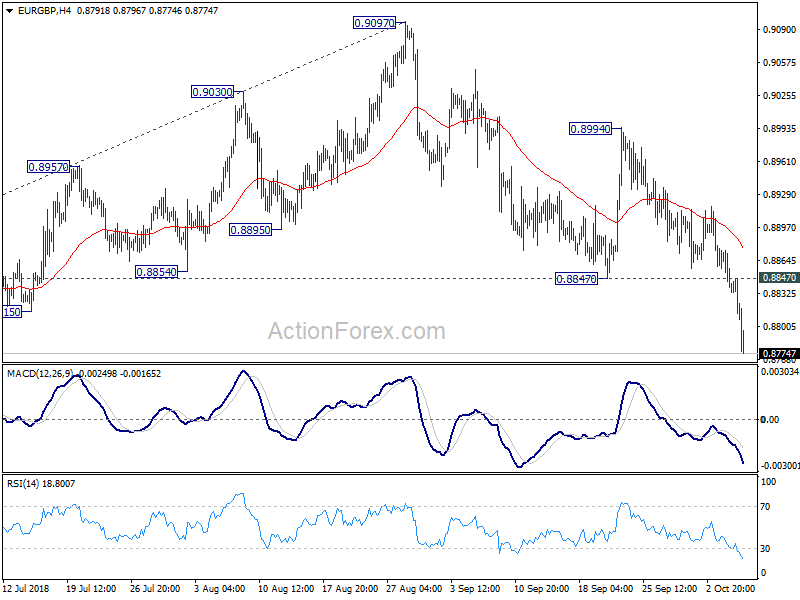 Decisive break there will resume whole down trend from 0.9304. 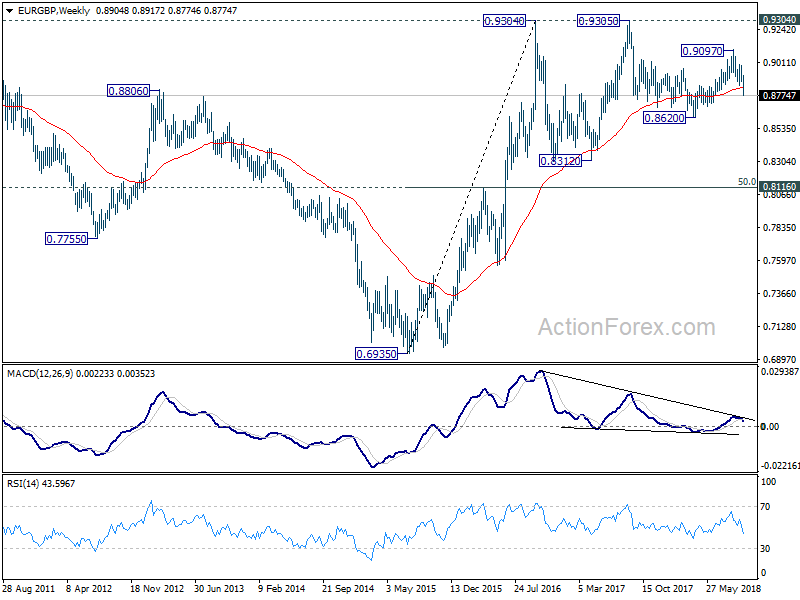 In that case, next target will be 100% projection of 0.9305 to 0.8620 from 0.9097 at 0.8412. 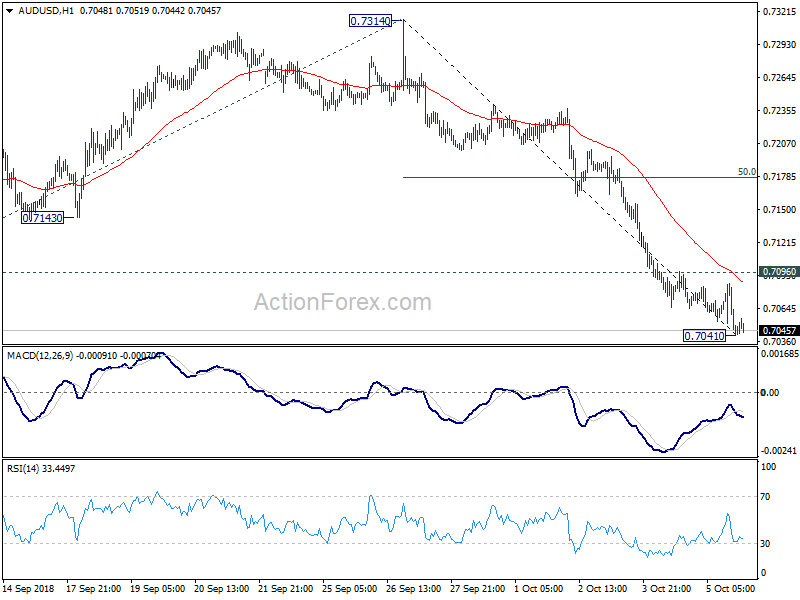 On the upside, break of 0.8847 support turned resistance is needed to be the first sign of short term bottoming. Otherwise, outlook will remain bearish in case of recovery. In the bigger picture, EUR/GBP is seen as staying in long term range pattern started at 0.9304 (2016 high). Current development suggests that fall from 0.9303, as a down leg in the pattern, is still in progress. But in case of deeper fall, downside should be contained by 0.8116 cluster support, 50% retracement of 0.6935 (2015 low) to 0.9304 at 0.8120, to bring rebound.